Let’s be clear when I say that summer is not over just yet in Arizona. It was well in the 100s this past weekend, and 113 on Sunday when I tried to go out and do some errands…and by errands I mean I went to the grocery store to get ingredients for deliciously refreshing wine spritzers because we were just parched from the heat. Now I’ve been trying out a lot of new products and I wanted to let you know what my sunny day essentials are since basically everyday is sunny and excruciatingly hot right now. Let’s do this thang! First off, I like to scrub my body to a pulp before applying any kind of tanning or bronzing product. 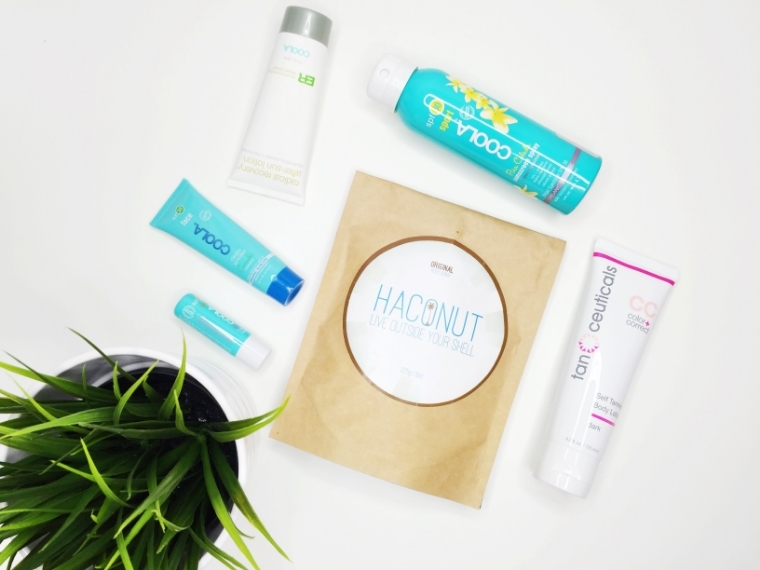 You’ve heard me rave about Joe’s Scrub many many times in the past few months, but I’ve also been testing out the Haconut scrub. It smells like coconuts and honestly makes me feel like I’m on an island somewhere…need I say more? I want to be bronzed and tan so of course I need a good self tanning lotion. What I’ve been enjoying about Tanceuticals specifically is that this is a lotion you leave on overnight. It didn’t get on my sheets, but you should be careful in case you sweat or have bad sweaty nightmares…trust me I have those nights and this lotion will melt off your skin if you’re sweating a storm. When I wake up, I take a shower and I am beautifully bronzed. It isn’t an orange tan either which is obviously a plus! I would warn you to be careful with how you apply because it could come off patchy if it’s not applied evenly. Honestly, if you’re new to self tanning I wouldn’t recommend this particular product because application is key. The first two times I used the product there was some patchiness around my elbows and knees but I’m no tanning expert so I blame myself for that. Once the exfoliating and bronzing is all said and done, I’m in need of sun protection. Lately I’ve been trying to find better brands of sunscreen. I’m tired of spending $15 for a sub-par crap sunscreen at Walgreens that always seems to leave me sunburned. All the items displayed from Coola are within the cutest and most perfect travel set. 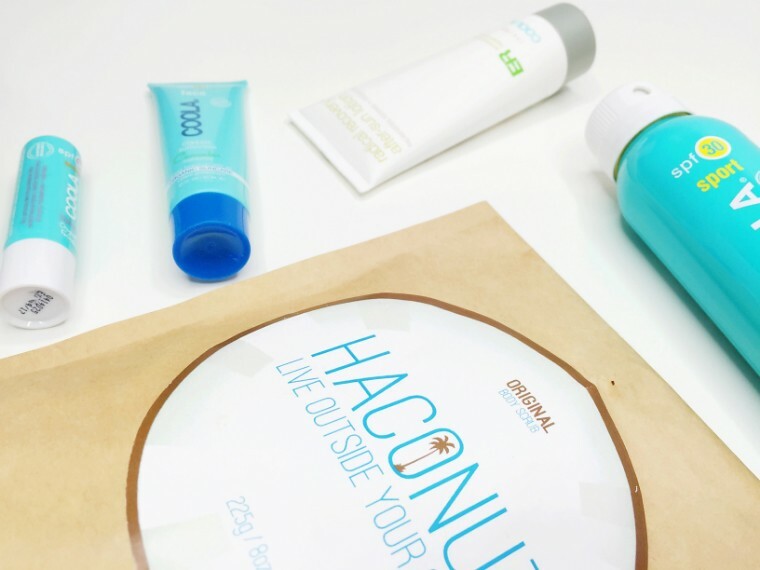 The set includes a delicious smelling colada sunscreen spray. I’m a big fan of sunscreen sprays because if you don’t have someone around to help, you can easily spray every part of your body. After the sun exposure, I like to use some kind of after-sun lotion as well as a moisturizer and this kit includes one of each. After having all of that sun exposure I like to make sure my skin is fully moisturized because the sun can really take out all of that hydration. Lastly, I like to keep my lippie lips hydrated and protected from the sun too. Nothing screams dehydration more than my own dry chapped lips…lipstick does not look on fleek when the lips are peeling so I enjoy keeping them moisturized. Use that chapstick people! 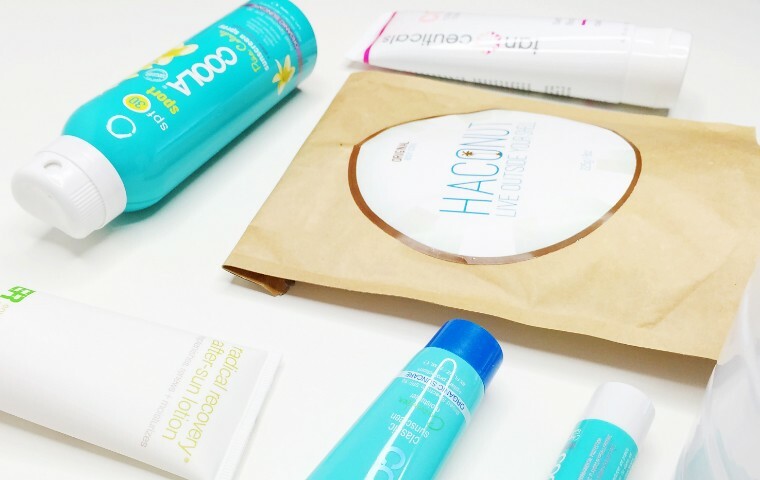 …and that’s it, these are some of my newest sunny day essentials! What are your sunny day essentials?